Gary Edgley has warned his Boston Town side they have to be ready for tonight’s Lincolnshire derby - or Holbeach United will ‘hurt’ them. This evening two of the United Counties League Premier Division’s forms teams meet at Carter’s Park. 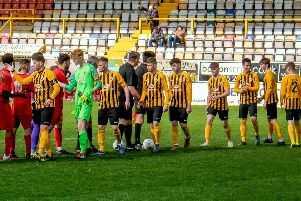 Edgley’s Poachers travel on the back of a seven-game unbeaten streak, but the fourth-placed Tigers have seven straight league wins to their name. “I have to really emphasise to the lads that this is a derby game, because a lot of our players aren’t from the town,” manager Edgley said. “The fact of the matter is, we can’t afford local players like the Holbeaches and Pinchbecks, so we’ve had to bring in young lads from out the area. “They’re good players, but they need to know it’s a derby game otherwise they’ll get caught out. The Tigers will be Boston’s biggest test to date in their unbeaten 2019 run.